Versatility: Range of models, offering feed rates from 3 GPD to 100 GPD at operating pressures up to 100 PSI. Low Maintenance: Lifetime lubricated, sealed, self maintaining gear train. Reliability: Four ball valve design for trouble-free operation. Durability: Strong, chemical resistant, flame retardant housing. Long Life: Metal reinforced, short stroke diaphragm. 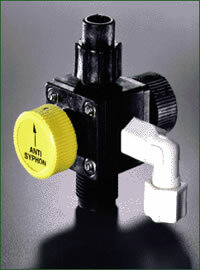 Simple Installation: Injection back pressure valve assembly enables injection at an angle and inhibits siphoning. 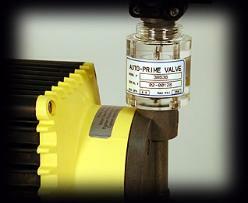 Bleed Valve Assembly: Aids in priming and relieves pressure from the discharge line. 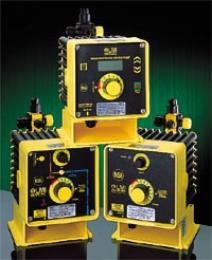 Electrical Requirements: 1/60 HP, 115V/60cy; 230V/60cy and 230V/50 cycle available on request. two solutions at different outputs. Versatility: Range of models, offering feed rates from 10 GPD to 120 GPD at operating pressures up to 150 PSI. Durability: Strong fibercore casing, and corrosion-resistant rubber and plastic solution handling components. Reliability: Oil immersed gear train and heavy duty, fan-cooled motor with thermal overload protection. Temperature Limitations: 122°F / 50°C max. All wetted components, including diaphragm, are completely interchangeable between allmodels. Heavy-duty design allows for continuous operation. Model U1 has dual manual controls for adjusting speed and stroke. Model U0, has single manual control to vary stroke. Uni-Dose pumps are UL, SA, and NSF approved. Quiet: Advanced noise reductin virtually silences the pump, making it ideal for household applications..
the power without the troublesome fans, open housings, motors and gears associated with motor driven pumps. 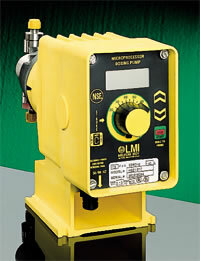 Safe: Inherent pressure relief stops the pump if the system backpressure exceeds the pump's strength. while eliminating the scaling and clogging associated with ball valves. 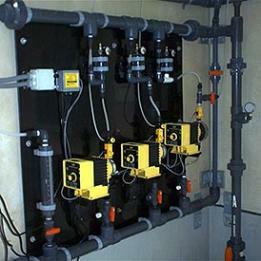 The FIRST electronic metering pumps designed specifically for the water conditioning industry. 4.1" x 7.0" x 7.75"
(not for export), 220-240 VAC DIN plug, 240-250 VAC UK plug, 240-250 VAC Aust. NZ plug, or 220 VAC Swiss plug. 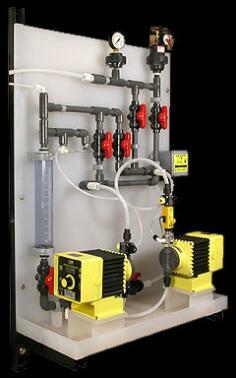 This series of pumps allows fully automatic operation and can be connected to a flow meter or other pacing device. Adjustable stroke frequency and the flexibility of up to 1000:1 turndown ratio. Manually adjustable stroke length provides accurate pump output adjustment. 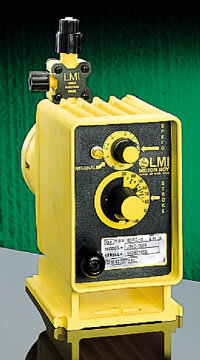 NEMA 4X / IP65 enclosures for protection against corrosive environments. Time tested electronics for reliable, repeatable performance. Totally encapsulated electronics for protection against moisture and corrosive conditions. Priming valves with Flourofilm™ diaphragms and ramp style knobs for "hands free" priming. Rigid stroke bracket assembly for highly accurate and consistent dosing performance. Advanced control options for simplified system integration (pulse multiply or divide, 4 - 20 mA, remote on/off). 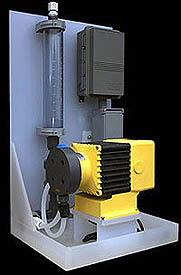 5-level power control option to reduce system shock and extend the life of the pump. External pacing for flow proportional applications. available are PVC, PVDF, Acrylic, UHMWPE, PGC, Polypropylene, and 316 SS. tight-fitting snap-on lids that lock odors in. 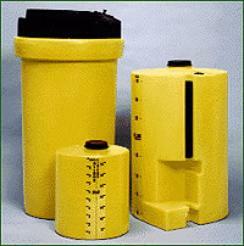 reliable yet inexpensive chemical container requiring virtually non maintenance. Tank is corrosion resistant polypropylene. Stand is welded stainless steel angle iron. Includes bulkhead for easy mounting of pump. 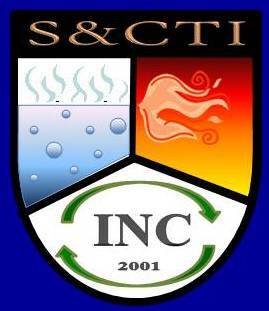 Ideal for any treatment problem where introduction of chemical solution into water lines is indicated. Chemical feed pump not included in assembly.